Sequens præfatio dicitur in Missis de beata Maria Virgine, addita suo loco mentione celebrationis diei, prout in singulis Missis indicatur. Sequens præfatio dicitur in Missis de Nativitate Domini et de eiusdem octava, infra octavam Nativitatis Domini, etiam in Missis, quæ secus præfationem propriam haberent, exceptis Missis quæ præfationem propriam de divinis mysteriis vel Personis habent, et in feriis temporis Nativitatis. Sequens præfatio dicitur: in Missis de tempore a die 17 ad diem 24 decembris; in ceteris Missis, quæ celebrantur eodem tempore et præfatione propria carent. Ioánnes cécinit affutúrum et adésse monstrávit. et in suis invéniat láudibus exsultántes. La Messa come la voleva il Concilio – p. Joseph Fessio s.j. Sorprenderà molti, ma non occorre alcuna autorizzazione per celebrare in latino. Infatti, non è possibile proibirlo, in quanto è ancora la lingua ufficiale della Chiesa cattolica romana e sempre adatta per la Santa Messa. It may come as a surprise to many, but no permission is needed for celebrating Mass in Latin. In fact, the use of Latin cannot be prohibited. It is still the language of the Roman Catholic Church and always suitable for Holy Mass. Traduzione italiana di D. Giorgio Rizzieri qui. Autore adminPubblicato il 5 Dicembre 2017 1 Dicembre 2018 Categorie Articles in English, Articoli in Italiano, Lingua latina liturgicaLascia un commento su La Messa come la voleva il Concilio – p. Joseph Fessio s.j. It is very important that we return as soon as possible to a common orientation, of priests and the faithful turned together in the same direction—Eastwards or at least towards the apse—to the Lord who comes, in those parts of the liturgical rites when we are addressing God. This practice is permitted by current liturgical legislation. It is perfectly legitimate in the modern rite. Indeed, I think it is a very important step in ensuring that in our celebrations the Lord is truly at the centre. Read the whole address in English here (in French here). 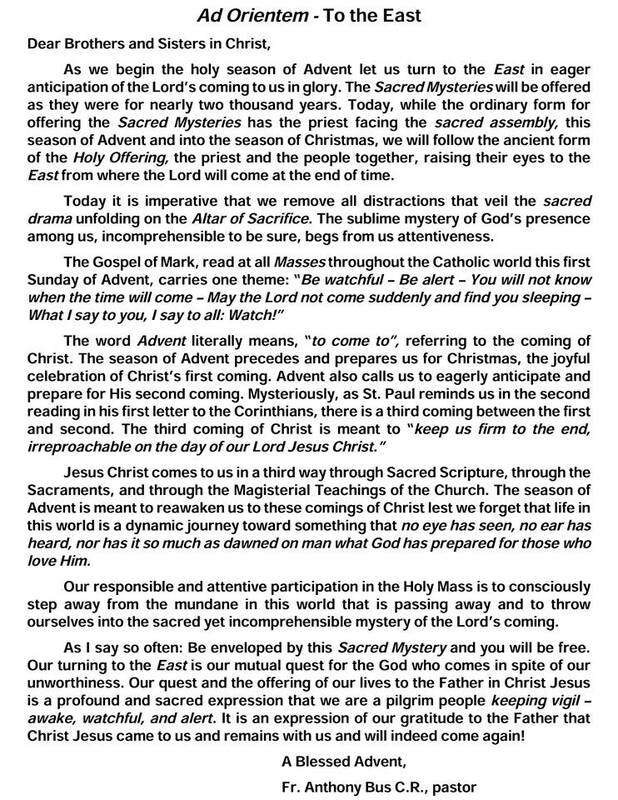 Celebrating Mass Ad Orientem (towards the East) or as most people wrongly say “with the priest’s back to the people” is an ancient practice that causes much bewilderment in modern Catholics. The point of facing east is to emphasize the essential character of the liturgy: that of a procession out of time and into eternity in Heaven. We see and taste this procession in the course of the liturgy. The celebrant, standing in the person of Christ, leads the way, but we are all moving together, as a community and as the people of God, as part of the same procession that begins at the Introit, continues through the Offertory, and culminates with our reception of Holy Communion. The practice offers a psychological and spiritual benefit. It permits the worshipper to contemplate the purely sacramental character of the Mass and focus less on the personality of the celebrant. From the celebrant’s point of view, it permits a more intense focus on the mystery of the sacrifice taking place rather than on the personalities of the worshippers. It has been the practice in the entire Church, East and West from time immemorial. Contrary to a prevailing misconception there is no evidence for celebration of Mass versus populum in the first nineteen centuries of the Church’s history, with rare exceptions. (Cf. The Spirit of the Liturgy, by Cardinal Ratzinger, pp. 74-84.) The practice of reducing an altar to a table for a service facing the people began only in the 16th century — with Martin Luther. Moving the altar closer to the nave, separating it from the reredos, and proclaiming the readings from the ambo are a welcome return to more ancient tradition and in harmony with the intent of Sacrosanctum Concilium. However, the almost universal celebration of the Mass versus populum, while permitted deprives the Mass of its traditional cosmic and eschatological symbolism. Churches have traditionally been constructed facing the rising sun. Facing East we are turned in expectation toward the Lord who is to come (eschatology) and we show that we are part of an act that goes beyond the church and community where we are celebrating, to the whole world (cosmos). In churches not facing geographical east, the Cross and Tabernacle become “liturgical East”. While there is some positive symbolism in Mass versus populum, there is also a very negative symbolism. “The turning of the priest toward the people has turned the community into a selfenclosed circle. In its outward form, it no longer opens out on what lies ahead and above, but is closed in on itself” (Ratzinger, p. 80). “Despite all the variations in practice that have taken place far into the second millennium, one thing has remained clear for the whole of Christendom: praying toward the east is a tradition that goes back to the beginning. Moreover, it is a fundamental expression of the Christian synthesis of cosmos and history, of being rooted in the once-for-all events of salvation history while going out to meet the Lord who is to come again” (Ratzinger, The Spirit of the Liturgy, p. 75). La parrocchia di San Stanislao Kostka a Chicago (USA) tornerà a celebrare ad Orientem nei prossimi tempi di Avvento e di Natale 2017. Leggi la storia qui (in inglese). The aim of the Graduale project is to record all of the chants contained in the current Graduale Romanum / Graduale Triplex – see http://gregoriana.sk/graduale/ for description.